Flat breads are made from both leavened and unleavened doughs. Both types have a general flat shape, although leavened flat breads are generally a bit taller and have a softer texture than unleavened flat breads. Although flat breads are made in all parts of the world, they are the preferred bread type in most of the Middle East and North African countries. 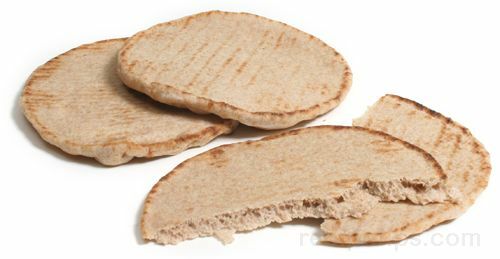 Description: A type of flat bread that probably originated in Egypt, but gradually became popular throughout the Middle East. The bread is baked into a round, flat shape. The diameter is usually smaller than pita bread, but the bread is slightly thicker. It is known by a variety of names depending on the country in which the bread is available. Description: A bammy is a pancake-shaped Jamaican flat bread. It is made from grated cassava root that is pressed in a cloth to remove the liquid. The grated cassava root is then mixed with salt, formed into a small round shape, and placed onto a baking sheet. It is pressed down during baking to maintain the flat, pancake shape. The bread is turned over once while baking so that it cooks evenly. Bammy bread is most often served as an accompaniment to fried fish or other fried foods. Description: A type of flat bread that is made into a variety of shapes and sizes. It is often made into small, rounded rectangles, diagonally slashed several times, and resembling flattened buns. Barbari is also made into larger flat rounds up to a foot in diameter. The bread is yeast leavened and it is often flavored with olive oil, which can be brushed on before baking. Some variations are also flavored with assorted spices or seeds. Type of flour used: a combination of buckwheat and wheat flour. The wheat flour is usually bread flour or all-purpose flour. Description: Buckwheat flour is often used for breads in the colder climate of northern European countries. The flour produces a bread with a dark color and a crumbly texture. Buckwheat bread has a distinctive flavor that may be an acquired taste for individuals who have not tried it. Since buckwheat flour is gluten free, it is usually combined with wheat flour so that the dough will rise. Buckwheat bread is often baked in a low cake pan or tart pan with a removable bottom and when cooled, the bread is cut into wedges. Buckwheat bread is difficult to slice when it is made into a loaf shape because of the crumbly nature of the bread. Description: A type of unleavened traditional flat bread of India made with chapati flour (atta), which is a very finely ground whole-wheat flour. There are many variations of chapatis such as rotlas or rotis, parathas, and pooris or puris, but the bread known simply as chapati is the flattest of the different varieties and is usually formed into a round shape that is 5 or 6 inches in diameter. Chapatis are cooked on a griddle with no oil or fat, but are occasionally brushed with ghee or butter after they are cooked. The chapati is most often used to scoop up other foods eaten with the fingers during a meal and is usually served with curries and other spicy dishes. Chapati is also known as khakhara. Description: A generic name for a variety of unsweetened bread products, which are thin, dry, and hard-textured and are commonly served as appetizers or as an accompaniment to a main dish. 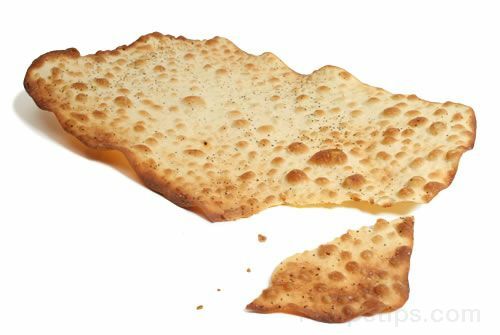 The name "cracker" is believed to be derived from the sound that is made when this food is broken apart. 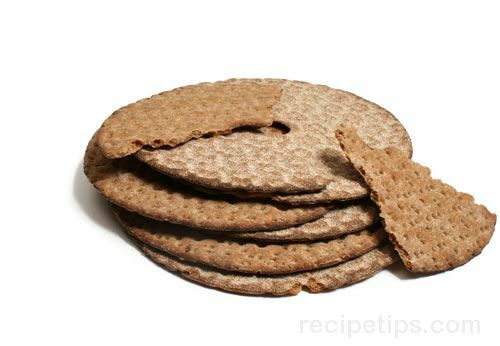 Some crackers are leavened, such as soda crackers, which are prepared with flour, water, and seasonings and are leavened with bicarbonate of soda, while a variety of other crackers are unleavened. Many commercially produced crackers contain holes spread over the surface, which allows for even baking and results in a crispy texture and a shape that is flat, thin, and uniform. 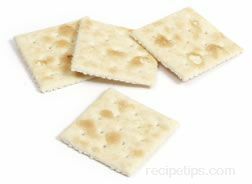 The term "cracker" is used to designate both the large variety of small, commercially prepared crackers and large, thin, crispy flat breads known as cracker bread. Crackers can be served plain as a snack or appetizer or they can be topped with meat, cheese, or spreadable ingredients. They are often served as an accompaniment to soups, stews, or a variety of main dishes. Description: Cracker bread is a generic term for crisp flat bread that is usually very thin and formed into a round, square, or rectangular shape. Cracker breads are a traditional food in Mediterranean, Middle Eastern, and Scandinavian countries and are now commonly available throughout the world. There are many types of breads classified as cracker bread and many of them keep for long periods - some, such as Norwegian flat bread (flatbrød), may last for as long as one year. Cracker breads are readily available in large food stores and ethnic markets. Description: Similar to one half of an English muffin, a crumpet is a round, soft yeast bread prepared from a batter. The batter is poured into a metal ring mold on a griddle and cooked to a brown smooth surface on the bottom while the batter on the top surface settles to become rough and filled with open holes. Crumpets are always served heated or toasted, topped with butter, jam, jelly, or cream cheese. The rough texture allows the surface to absorb and hold any spreadable topping added to the crumpet. 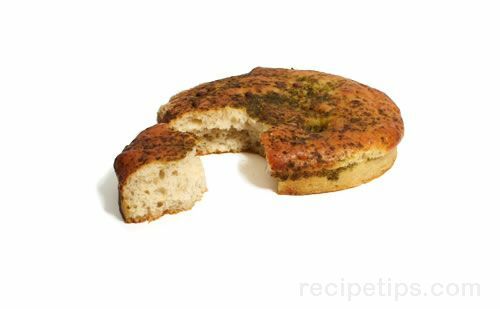 Description: A savory, leavened, Italian flat bread, flavored with various ingredients, which may include herbs, olive oil, tomatoes, eggplant, roasted peppers, olives, and cheese. Traditional focaccia bread is very flat, but some loaves can be quite thick depending on the type of ingredients stuffed into the bread or used for toppings. Any of the ingredients that are stuffed into the dough or used as toppings should not require a longer cooking time than the bread dough in order to achieve the best results. Some ingredients, such as certain vegetables, may require partial cooking before they are added to the dough. Description: A type of French bread that is formed into a flattened shape with elongated holes, which give the bread the appearance of tree limbs. It is made with a basic bread dough or a sourdough and it is often flavored with olive oil and a bit of sugar. Anise is another traditional ingredient that is sometimes used to provide a distinctive flavor. 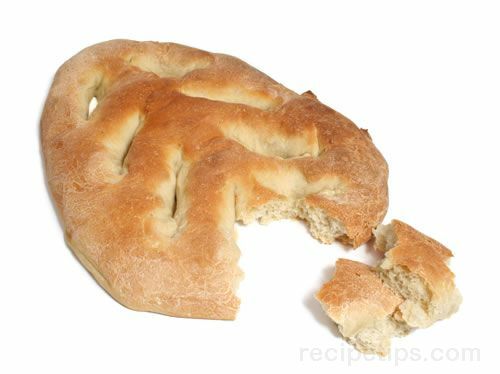 Fougasse is a popular bread in southern France and is often compared to focaccia bread of Italy. Description: A type of popular Mexican flat bread that is often used as a sandwich wrap or an open-face sandwich, such as a corn cake patty. 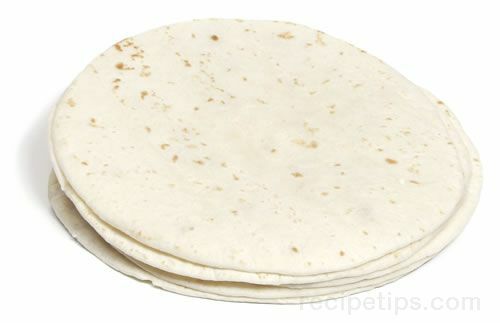 When used as a food wrap, the gordita is slit open, similar to a small version of pocket pita bread, and the sandwich ingredients are placed inside. When it is used as an open-face sandwich bread, fillings are placed on the surface similar to an English muffin. Gordita bread preparation begins with corn-based dough (masa) mixed with water, which is then formed into a small round tortilla shape approximately 4 inches in diameter and 1/4 to 1/2 inch thick. The shape is similar to a plump type of tortilla, which are usually thinner and wider than gorditas. When the gordita is ready to be cooked, the dough is placed on griddle or skillet and "baked" for 1 or 2 minutes on each side. The top and bottom of the gordita is well cooked, but the sides remain slightly uncooked, which is beneficial if a pocket sandwich is desired. 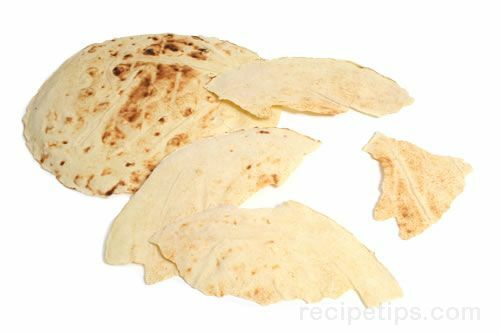 A knife can be inserted into the bread after cooking to open up the gordita similar to a pita pocket bread. In order for the bread to be used in this fashion, some cooks suggest pinching the outer edges together prior to cooking except in the area where the opening is to be made for the food pocket. Prior to filling the gordita with sandwich ingredients, the bread is cooked again, this time in a saucepan or a skillet containing 1/2 inch of oil. The bread is first fried on one side for 10 to 20 seconds before being turned to fry the other side. The intent is to achieve a crispy outer shell while the inside retains its moistness and flakiness. As it cooks in the oil, the Gordita puffs up, becoming plump and fat. This characteristic is what gives the bread the name, "Gordita," which means "little fat one" in Spanish. The next step in the gordita pocket sandwich assembly is to stuff the pocket with various sandwich ingredients. 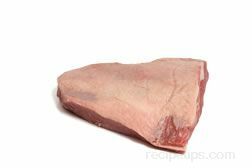 The ingredients may include the traditional shredded beef, onions, and chilies or a variety of other tasty ingredients, such as poultry, cheese, vegetables, or guacamole mixtures. In addition to the bread-wrapped sandwich version, another gordita variety is also popular. A plump patty can be formed using masa harina (corn flour) as the base ingredient. The patty is often topped with additional fresh ingredients, such as bits of peppers, lettuce, and/or salsa. Often sold by street vendors as a small sandwich, the Gordita is a versatile food that can be served as a snack, an appetizer, or as a main meal with a variety of different ingredients. Description: Injera is an Ethiopian flat bread that is very thin and somewhat crepe-like in appearance. Made from flour ground from teff, a grain cultivated in Ethiopia, the bread begins as a batter that is poured into a skillet or baking pan and made into a round-shaped flexible flat bread that is baked only on one side. If the batter is allowed to ferment, it becomes a sourdough bread. Injera is a common accompaniment to evening meals in Ethiopia where it is used as a base on which other foods, such as meats, poultry, fish, or vegetables, are piled and then eaten. Injera is also broken apart and used as a wrapping for food pieces or it is often used to scoop stews and gravies directly from a plate. 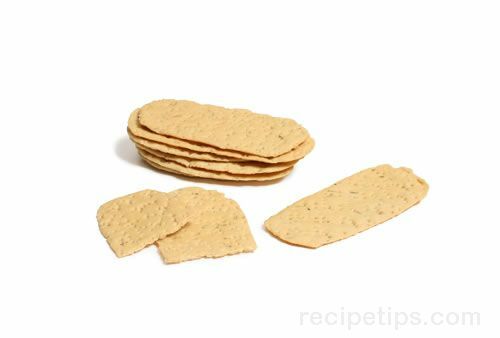 Description: A brittle, cracker-like Italian flat bread made with white flour that is rolled into very thin sheets. It is formed into rounds or rectangles and is often served with olive oil as part of an antipasto course. 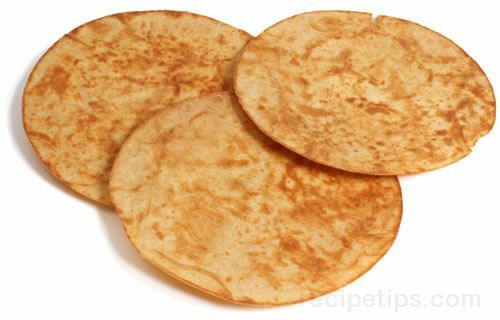 Description: A flat bread that is a traditional food of India. Round, very thin, and soft to crispy in texture, khakhara is a bread that is most often rolled up and used in a manner similar to a utensil to scoop or absorb other foods, such as beans or curried foods. Typically, the khakhara is made with flour, water, and seasonings. The dough is formed into a flat, thin-centered bread that is thicker on the edges. Khakhara, which may also be referred to as Rotli or Chapati, can be baked or fried to create the desired texture, depending on the types of foods it will accompany. 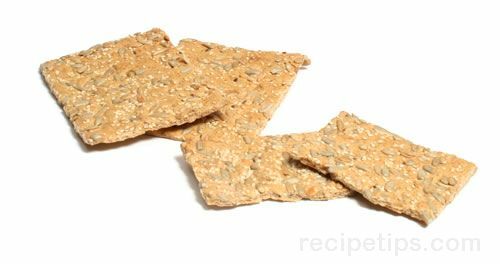 Description: A type of Finnish crispbread that is formed into large, thin, brittle rounds with a hole in the center. The bread has the appearance of a large, flattened donut. Knackebrod is prepared with rye and corn flour, has a crunchy texture, and a delicious grainy flavor that is not as sweet as its Swedish counterpart knackerbrod, made with oatmeal, butter, and sugar. 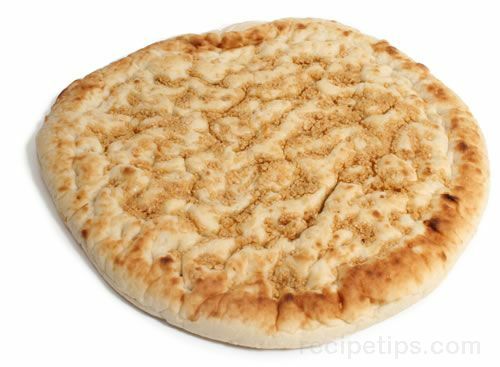 Description: A thin Armenian flat bread that is enjoyed throughout the Middle East. It is traditionally made from a dough that is formed into a circle or oval from 6 inches to 24 inches in diameter and baked. It is usually made into a very thin and crisp, almost cracker-like, bread that is eaten immediately following baking. The bread is usually torn into pieces when eating. There are many variations of lavash. Some are leavened and others are not. 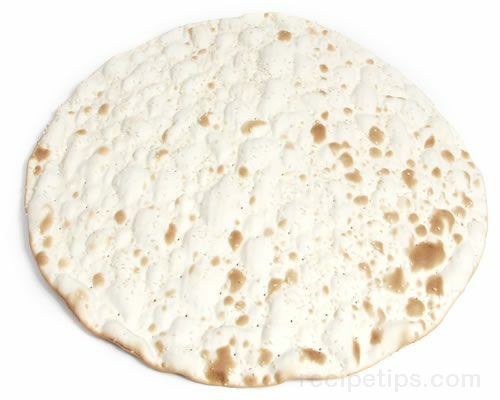 Lavash is also known as Lavosh, Lahvosh, Lawaash, Paraki, and Armenian cracker bread. Description: A round flat bread that is Scandinavian in origin, made from a mixture of flour, cooked potatoes, cream, salt, and butter. Some recipes also call for sugar. The lefse dough is formed into small balls that are rolled into very thin rounds. The dough is cooked on a griddle (there are special round griddles available specifically designed for making lefse and similar flat breads) until it is lightly browned; then it is turned on the griddle to brown the other side. After cooking, the lefse is placed on a clean white towel to cool. Lefse is often buttered and rolled or folded prior to serving. Sometimes, sugar is sprinkled onto the buttered surface before the lefse is rolled. 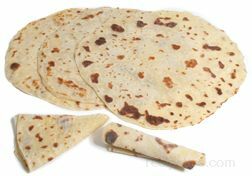 Lefse is also used as a food wrap for almost any type of ingredient. Sliced luncheon meat, ground meat, cheese, chopped vegetables, jams, and jellies are only a few of the foods that can be used, creating a sandwich or tortilla-like dish. Description: Mannaeesh (or Mankoush) is a soft Lebanese bread that is shaped into a flat, 5-inch round with a concave surface. The concave surface is filled with an herb, spice, and seed blend known as za'atar, which is a combination of thyme, marjoram, sesame seeds, and ground sumac. Some recipes may omit the sumac because some people do not care for the strong, sour flavor it provides. 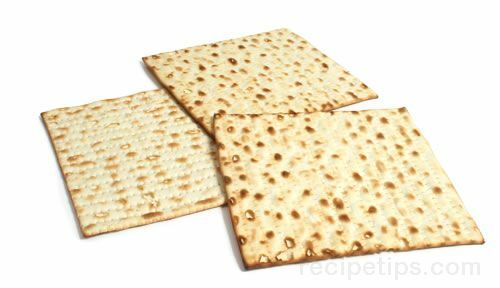 Description: Matzo is an unleavened flat bread or cracker bread that is a traditional bread made for the Jewish Passover. It is baked into thin sheets that can be easily broken apart for serving individual pieces. When served for Passover, the bread is made only with water and flour and is made under strict guidelines so that the dough does not rise during preparation. Matzo is increasingly being served throughout the year as a snack or appetizer cracker, which may be made and seasoned with additional ingredients, unlike the traditional recipe. In addition to being served as a cracker bread, matzo may also be used as an ingredient to make matzo meal (fine or coarse ground cracker meal), matzo dumplings known as matzo balls for matzo soup, or for a variety of puddings and other food dishes. Matzo is also known as "matzoh." Description: A leavened flat bread originating from northern India, which is traditionally baked by slapping the bread dough onto the side of a hot dome shaped clay oven referred to as a tandoor. The dough's weight would normally cause it to fall into a teardrop shape, which is the recognizable characteristic of naan bread, however, with changes in baking processes there are now a variety of shapes from round to oval that are readily produced. The basic ingredients in naan bread include yogurt and white flour, which can be enriched by adding an egg. There are a variety of flavors produced, such as naan with sesame seeds, whole-wheat naan, herbal flavored naan, and other flavored varieties that are still made with the traditional tandoori baking method. For serving, naan can be filled with various ingredients such as onion, garlic, salsa, meats, cheese, and then folded over or rolled to create a sandwich. Naan can also be cut it into individual pieces and dipped into sauces, salsas, oils, curry, or hummus. It has a dense chewy texture and is best eaten when it is still fresh and hot. Naan is also known as nan, non, nane, or none bread. Description: Traditional An Indian cracker bread most often served as a complement to a main dish, but also often used as a snack or appetizer that can be topped with chutney, various dips, or salsas. Commonly made in different sizes, papadums may be small for snacks or larger in size to be used as a food wrap. Typically, it is prepared using black gram bean flour, lentil flour, rice flour, or potato flour with salt and peanut oil added. The ingredients are made into a dough that is formed into a thin, round shape similar to a tortilla and is grilled or fried, making it either soft and moist or crisp in texture. As the dough is prepared, it can be seasoned with a variety of different ingredients such as chilies, cumin, garlic, lentils, pepper, or other spices. 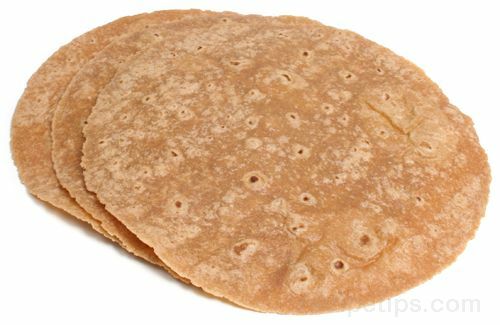 Papadums are also known an Indian wafer, a lentil chip, or pappadams. Description: A type of versatile flat bread that is soft, slightly chewy, and often features a pocket inside, which is a result of baking the bread in a hot oven. 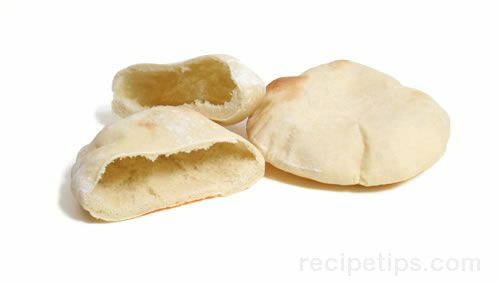 Because it is a flat bread, pita is often mistakenly considered to be unleavened, but it is indeed leavened with yeast. The bread is often eaten plain or dipped in olive oil. It can be topped with spreads and meats, folded over, and eaten as a sandwich. Pocket versions can be stuffed with various fillings. The popularity of pita bread has spread beyond Turkey, Greece, and the Middle East. Pita bread is also known as pide, which is the Turkish name, and pideh, which is the Armenian version, prepared with whole-wheat flour and is topped with sesame seeds. In the United States, pita bread is often called pocket pita or simply pocket bread, which is the most popular commercially prepared, supermarket type of pita bread. Description: A type of yeasted flat bread made with white flour that is similar to a thin, crispy pizza crust. It has a delicious peppery flavor and a crunchy, cracker-like texture. Some versions contain bits of prosciutto ham and grated hard cheeses, such as parmesan, that are kneaded into the dough before baking. The dough is formed into round or rectangular shapes. Pizza rustico is often served with antipasto courses or as an accompaniment to a meal. Description: An Italian flat bread, similar to focaccia, that is often referred to as a Tuscan flat bread. It is prepared with a bread flour dough that is shaped into rounds or rectangles. The surface is dimpled and is usually brushed with olive oil and sprinkled with coarse salt and rosemary and then baked for a short period of time. Schiacciata is often topped with a variety of ingredients including thin slices of prosciutto, various herbs, onions, peppers and grated cheese. Description: A flat pastry-like bread that originated in regions of northern Mexico and the southwestern United States. The dough is prepared with bread flour or all-purpose flour, water, salt, and vegetable fat and is usually leavened with baking powder. It is formed into rounded shapes of varying sizes and is deep fried to create a puffed up, crispy outer texture that is airy and open on the inside. The plain bread often accompanies a main dish or it can be served as a dessert when garnished with syrup or honey and cinnamon or powdered sugar. 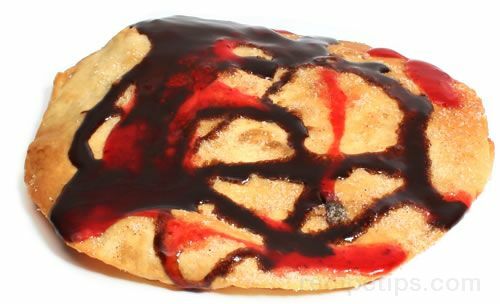 The sopaipilla can also be filled with fruits or cream fillings and topped with sweet sauces or pureed fruit. Description: A type of crispy, cracker-like flat bread prepared with spelt flour. Some recipes are made with additional whole-grain spelt, which gives the flat bread an interesting texture and nutty flavor. Other versions may also contain a number of other whole grains, bran, or seeds. Spelt crackers can be served with jams and jellies as a breakfast item or as a hearty addition to soups and stews. Description: A soft, thin, flat unleavened Mexican round bread made from corn flour, masa harina (which is a type of corn flour), or wheat flour. It is one of the most common breads in Mexico, but it is popular in many other parts of the world, especially in the areas of the United States Southwest that are adjacent to Mexico. Tortillas are baked traditionally on a griddle known as a "comal." A tortilla can be eaten plain, but it is most often used as a food wrap to hold ingredients such as meat, poultry, seafood, cheese, beans, onions, and peppers. Commercially prepared tortillas available in food stores are typically found in sizes ranging from six to twelve inches.